Thanks to all who sent in emails and spoke with commissioners, the Ruskin Community Plan is headed for firmer ground, AND our county commissioners received a strong message from people all over the county that we expect them to follow ALL our Community Plans. Please send a thank-you note to commissioners for addressing our concerns (see sample below). We’ll have to continue watching & participating in the process to keep things on track, but their general plan is good. 1.) Write the Ruskin Community Plan’s Guidelines into the Land Development Code (LDC), where they will be firmly enforceable. County staff promised to do that ASAP, in the current Round I cycle of hearings, so it should go into effect in a few months. We’ll need to participate in this process, by attending hearings and sending in written comment, to ensure that Ruskin’s Guidelines don’t lose any teeth as they are rewritten into Land Development Code language, and to see that the process does not get delayed. This will be an important test case for ALL Community Plans, as they will all soon go through a process of having some of their Plan elements implemented into the Land Development Code (LDC), so we’ll all want to make sure this process stays true to the intent of the Community Plans. 2.) 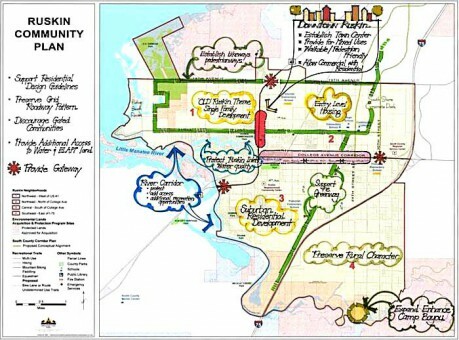 In the meantime — until the Guidelines can be written into the LDC — commissioners directed staff to clearly identify any rezonings within the Ruskin Community Plan area, as they come up, and let commissioners know whether a zoning application complies with the Guidelines or not, when they are deciding whether to approve or deny any new development plan. That leaves them some wiggle room, so we’ll have to keep an eye on them. But I was there, and I can tell you that as they made this motion, their discussion showed that (thanks to all your emails!) they have come to understand the importance of these Guidelines. At their request, the County Attorney, Chip Fletcher, advised them as to how they could legally honor the Guidelines, even before they are codified into the LDC, so that the recently discovered “loophole” need not be a problem during this time. Although public comment is not typically taken on this sort of agenda item, I was allowed to speak to the commission as they made this decision, and I heard their discussion, and came away feeling that our county commissioners listened to us and worked with staff to find an acceptable solution. Commissioner Kevin Beckner led the board discussion with pertinent questions, key evidence, a real sense of fairness, and strong support for the community. The discussion involving commissioners Kevin Beckner, Sandra Murman & Mark Sharpe showed all had done their homework, listened to citizens, understood the issues, and were concerned to maintain the trust of the community and keep the county’s promises. Commissioner Ken Hagan was quiet during the discussion, but he replied by email to citizens saying he is “very pleased” with the outcome, and he did vote in favor of the Board’s final motion, which passed 4–0. There are 7 commissioners, so why the 4–0 vote? Let’s thank the commissioners who worked for us, and let ALL of them know we’re still involved. I am glad to see that the Board voted to put the Ruskin Community Plan’s Guidelines into the Land Development Code (LDC) in the current cycle, so they can be installed quickly, with the final public hearing on May 29. ALL Community Plans represent the will of the people and deserve your full support. I appreciate your working to build trust among the citizens that our government will keep its word and stick to the Community Plans in which citizens have invested so much. Thanks to Barbara & Tom Aderhold, of Keystone, who joined me in meetings with commissioners and a Tribune reporter, helping them to understand the ramifications to ALL Community Plans when any ONE Community Plan is violated without public process. Thanks to Tampa Bay Sierra Club for sending a letter of support to the County Commission. Thanks to Tampa Tribune reporter Yvette Hammett for shining a light on this, without which the county might not have taken it so seriously. The Tribune is the only local news outlet that reported on this important issue, and Yvette Hammett’s excellent writing brought clarity to the whole wonky mess. The biggest thanks go to all of YOU citizens who contacted commissioners to tell them this is important to their constituents.